Spacious condo offering 4 bedrooms, 3 bathrooms. Downstairs: Living room, Kitchen/Dining area, Sun room, Mud room, Room 1: Queen bed w/full ensuite bath, Room 2: Full bed, hall bath with shower and washer/dryer. Spiral staircase to second floor. 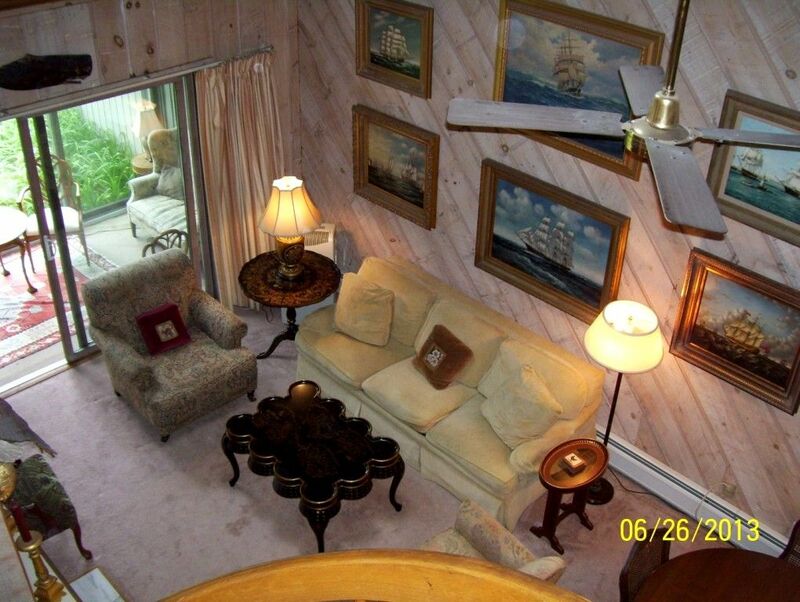 Upstairs: Room 3: Full bed, Room 4: Twin beds, hall bath with shower. Kitchen includes electric stove/oven, refrigerator, dishwasher, microwave, toaster oven, Keurig coffee maker. Wi-fi and cable tv available in living room. Linens and towels provided. Guests have use of the tennis courts and pool. Please bring your own towels for the pool. A walkable downtown with much to see and visit. Close to all Manchester's fine and casual dining spots. World-class outlet shopping minutes from the condo. Stunning mountains views, enjoy fall foliage in Vermont! Renter must bring own firewood or can purchase at local market. Bath towels only, please bring towels for pool use. Detergent for hand washing dishes and for dishwasher. Laundry detergent, paper towels, toilet paper, hand soap, other housekeeping cleansers. Small patio with outdoor furniture. We enjoyed the location and comforts the condo provides. The owner was very easy to deal with. A lovely condo in a quiet setting. Loved the location and the view of the mountains especially in the morning. It was a very quiet, restful setting. Accommodations were very suitable. The pool and the tennis courts were a nice addition. Thank you and we hope you will stay with us in the future! This condo is wonderful! Great location and everything was just as described. Linda was so accommodating and answered all of my questions in a timely manner. The property description was 110% accurate. I would definitely stay here again in the future! Thank you! And thanks for leaving the condo in such great condition. We hope you can come back again! Just 2 miles from downtown Manchester Center and Manchester Village. Spectacular mountains views await you in this quiet location close to all amenities. Manchester has a walkable downtown with lots of choices for recreation, shopping or browsing, yet is just minutes from skiing and snowboarding. Whether it’s a half marathon, antiquing, biking, canoeing/kayaking, golfing, hiking, designer outlet shopping, music, theatre, or just relaxing by the pool on site or a game of tennis on site, the stunning beauty of this four season destination has something for everyone.